Thank You Argentina for Chimichurri Sauce! 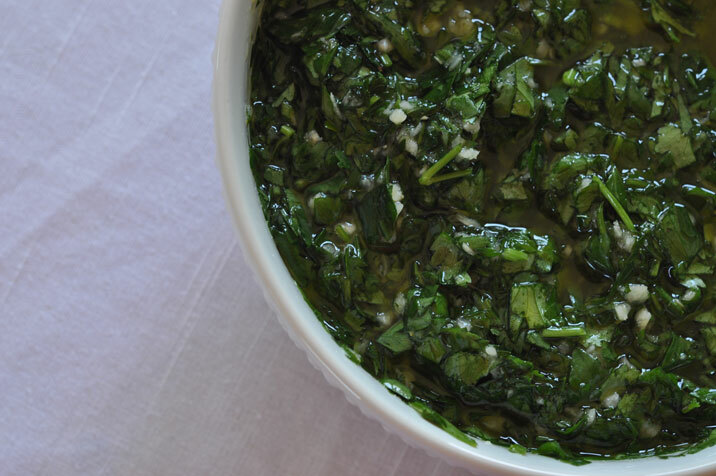 garlic-y, wonderful chimichurri sauce. Thank you Argentina! I absolutely love chimichurri sauce. It’s green, garlic-y, and so very fresh tasting. Originating in Argentina, this version is from the Nordstrom Flavors Cookbook. Wimp that I am, I leave out the red pepper flakes and most of the black pepper….Reserve some to serve with your favorite grilled meat and use the rest to marinate your preferred meat for 12 to 24 hours. In a large bowl, whisk all of the ingredients together. Use is as a marinade & sauce.